We will visit 4-8 Roadside Chapels. Tours include a stop at the Belgian communitys most important chapel – the National Shrine of Our Lady of Good Help – built on the site where the Blessed Virgin Mary appeared to a young Belgian woman in 1859. 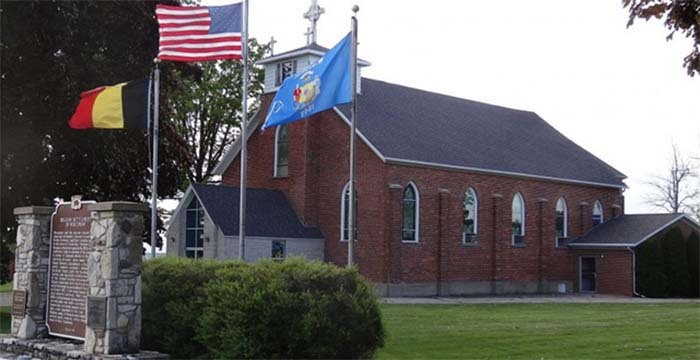 Fondly known as simply as the Chapel in the local community, your group will hear the remarkable history of this site and stroll the grounds of the only Marian apparition in North America deemed worthy of belief by the Catholic church. Itineraries are customized for your group and may include: Belgian Heritage Center, Namur National Historic District, Norbertine Birthplace/1859 Convent and Schoolhouse, Traditional Belgian lunch featuring booyah, trippe (pork/cabbage sausage), jutt (fried cabbage) and Belgian pie. Tours are typically 3-4 hours. Belgian Heritage Center will provide step-on guide, lunch (if requested) and arrange access to all stops. Tour operators are responsible for transportation and all other expenses.